This is the newly translated novel by Olga Tokarczuk, whose Flights (Bieguni) which we read last year was the winner of the International Man Booker Prize in 2018. Mark found that different pictures – vignettes – suddenly reveal themselves. Diane found it a multilayered book: elements include the treatment of animals, their rights and responsibilities. She loved the character of the narrator, Janina Duszejko (JD), who is both an empiricist, with knowledge of Newtonian mechanics and, diametrically opposed, a linguist (an English teacher). Is she crazy? She does speak to her (long dead) mother in the basement. At what point do we realise it was her? (About halfway through.) Diane didn’t become emotionally attached to any of the other characters. Krystyna disliked her, and wanted to call her Janina, despite her professed dislike of the name; Krystyna found her giving names to people judgemental. She lived in a kind of self-exile; we’re given only hints and fragments of her past. She feels disdain towards her fellow humans, and is hostile to conventional religion. Others, especially the mushroom-pickers (foragers, rather than hunters), show kindness to her. The references to Blake, and the capitalising of (some, not all) nouns are a distraction, not linked to the story. Does the title refer to the mass graves found across Poland? JD is lucky to live when she does. Robert found the book well written but contrived. He found the fact that JD was both an engineer and an astrologer implausible. 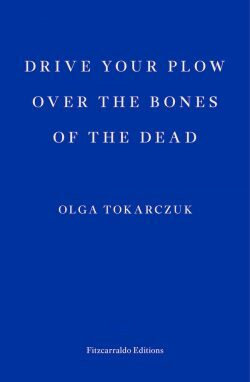 He wondered what of herself Olga Tokarczuk had put into the book. Zenon was surprised the book was billed as a ‘noir novel’, and found many of the scenes were unrelated to others. JD becomes rational at the end, in her ‘escape’, less dotty than before; are the ‘Ailments’ she refers to nervous breakdowns? She combines engineering and astrology like an 18th century natural scientist. She names people instinctively, according to how they strike her. The Polish text plays with forms of address unavailable in English. Ken enjoyed the book, and found the Blake references gave it a context beyond the ‘local’, so we can see these events and actions on a grand, even cosmic, scale. He recalled the description – borrowed from Blake? – of a divine spark falling through space and gradually diminishing in power until it reaches the earth, almost but not quite burned out, and forms a human soul. In this sense we are all equal, and human notions of hierarchy are meaningless. He had also enjoyed discovering (on YouTube) various versions of the song ‘Hey, Falcons’, which is so popular at the Mushroom-Pickers Ball. The novel also references ‘The House of the Rising Sun’, made famous of course by The Animals, who Magda recalled seeing in Warsaw in the 1960s. Elwira remarked on JD’s stubborness, and how she sees through our usual coping mechanism, which is to avoid the unvarnished truth. When she does so, she kills what she sees as evil. The role of a priest is to make people more human, sensitive, spiritual; here he doesn’t do this, and no-one reacts to this, other than JD, who finds his words unacceptable. The animals’ taking revenge is simply her wishful thinking. She is a literary construct; we are asked to acknowledge her spiritual understanding in a metaphorical, rather than mimetic, way, within the rules of this particular literary universe. We organise the world through language; here, in a Polish context, English – and Blake’s very particular use of it – offers an alternative way of doing so. Some have said the book advocates eco-terrorism, but that is going too far. For Magda the scene in the church, when JD challenges the priest, recalled Christ in the temple challenging the money-lenders. To what extent may we express our anger? To what extent should we stop killing animals and eating meat? Zenon recalled the principles of kosher slaughter, which place humans in a chain of being. Hunting for sport is a form of hubris. Green politics don’t work without transcendentalism. From the general discussion: The book underlines the irony of Hubertus becoming the patron saint of hunters, when he is remembered and venerated for not killing a deer. For humanity animals are a source of both food and danger, and also offer examples of being in the world we can learn from. The Christian theory of the ‘Just War’ did not stop medieval kings from doing penance for killings after a war had taken place. JD is a product of socialism –athlete, engineer, aetheist (astrology –?). Her mother and her grandmother are her guilty conscience, and she shuts them out. Rereading the novel again from the start you can see how JD’s actions are anticipated, even in the epigraph from Blake to the first chapter, which acts as a summary of the whole book. Is there too much astrology in the book? JD tries to persuade the police that the men had to die because of the stars.